The IDEAL II DNA Ladder is a molecular weight standard specially designed for electrophoretic analysis of medium and large DNA fragments on agarose and non-denaturing polyacrylamide gels. Ideal for sizing of PCR products, digested plasmids and medium or large double-stranded DNA fragments. 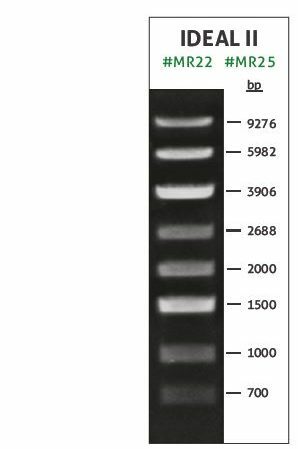 IDEAL II DNA ladder contain purified blunt-ended PCR products and cohesive-ended restriction fragments. The IDEAL II DNA Ladder is also supplied in a ready-to-use version pre-mixed with 6x GREEN DNA loading buffer. DNA Ladders are supplied with 6x Green DNA Loading Dye (AG18) (500 µl). IDEAL II DNA Ladder is a olecularm weight standard specially designed for electrophoretic analysis of medium and large DNA fragments on agarose and non-denaturing polyacrylamide gels. Ideal for sizing of PCR products, digested plasmids and medium or large double-stranded DNA fragments. Ready-to-use version is pre-mixed with 6x GREEN DNA loading buffer. M100-1000 DNA Ladderis a molecular weight standard specially designed for electrophoretic analysis of small and medium DNA fragments on agarose and non-denaturing polyacrylamide gels. Ideal for sizing of PCR products and relatively small double-stranded DNA. It is especially useful for determining 100 bp differences between DNA fragments. M100-1000 DNA ladder contain purified blunt-ended PCR products. M100-1000 -DNA Ladder ready-to-use is a molecular weight standard specially designed for electrophoretic analysis of small and medium DNA fragments on agarose and non-denaturing polyacrylamide gels. Ideal for sizing of PCR products and relatively small double-stranded DNA. It is especially useful for determining 100 bp differences between DNA fragments. M100-1000 DNA ladder contain purified blunt-ended PCR products. The M100-3000 molecular weight DNA ladder is designed for determining the size of PCR products and dsDNA fragments in the 100-3000 bp range. 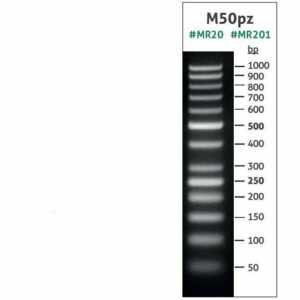 The M100-3000 DNA Ladder is a mixture of specially selected, purified blundended PCR products. The DNA Ladder gives a clear band pattern, with two bands of increased intensity employed as reference points. 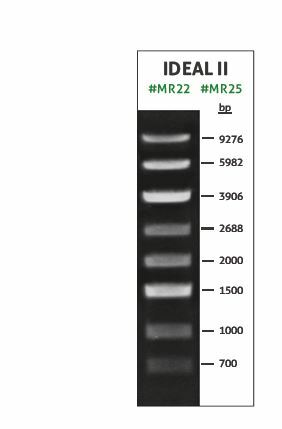 The M100-3000 DNA Ladder is also supplied in a ready-to-use version pre-mixed with 6x GREEN DNA loading buffer. The M100-3000 DNA Ladder ready-to-use molecular weight DNA ladder is designed for determining the size of PCR products and dsDNA fragments in the 100-3000 bp range. M100-500 DNA Ladder - molecular weight standard specially designed for electrophoretic analysis of small DNA fragments on high percentage agarose (2-3%) and non-denaturing polyacrylamide (8-16%) gels. Ideal for sizing of PCR products and short double-stranded DNA fragments. 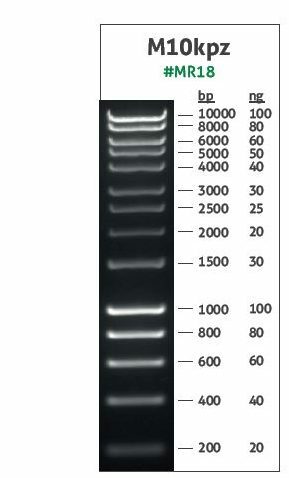 M100-500 DNA ladder contain purified blunt-ended PCR products. M10kpz is a ready-to-use molecular weight marker, especially designed for easy size determination. This ready-to-use format reduces handling steps and saves time; simply transfer M10kpz I from the vial to the gel. The M50-1500 Fast DNA Ladder is specially designed for fast and accurate sizing and quantification of double-stranded DNA in 48-well (or 96-well) gels as well as in conventional agarose gels. The M50-1500 Fast DNA Ladder is a mixture of specially selected, purified PCR products: 1500, 800, 400, 200, 50 mixed in equal quantities. The M50pz molecular weight DNA ladder is designed for determining the size of short and medium PCR products and dsDNA fragments in the 50 - 1000 bp range. The M50pz DNA Ladder is a mixture of specially selected, purified, blunt-endedPCR products. The DNA Ladder gives a clear band pattern, with two bands of increased intensity employed as reference points.